PORTLAND, Ore. (October 16, 2018) – Through research commissioned by Pear Bureau Northwest, it is known that the consumers buying 74 percent of USA Pears are 25 to 45 years old, with the majority under 34. According to a 2014 Usage and Attitude Study conducted by Fusion Marketing, the majority of consumers want to eat pears within 1 to 3 days of bringing them home. One cornerstone of the organization’s efforts to satisfy the consumer desire for tasty fruit soon after purchase is through a conditioned pear program that can get consistent, riper fruit on the shelves of retailers. Throughout the 2018-19 season, Pear Bureau Northwest will be focused on an aggressive reintroduction of the conditioned pear program. The Pear Bureau has had an active push toward conditioning for many years, collecting and conducting research on the proper way to condition pears and the benefits of conditioning. There are currently 42 retailers in the U.S. and Canada that are carrying conditioned pears. This is a solid base, but it has been slower to increase in the past few years. Recently, the organization revamped the conditioned pear section on its website dedicated to providing retailers with research, data, and education to show that committing to a conditioned pear program can lead to double digit sales increases. 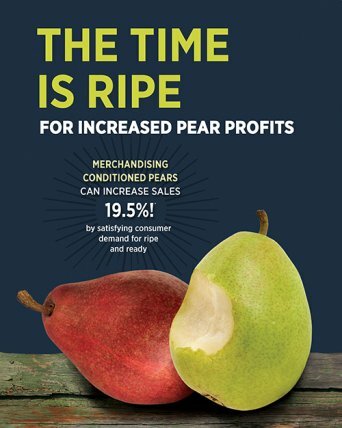 Among the information presented, the page highlights 2012 research by Nielsen Perishable Group, which found that ripe pears can outsell unripe pears by 19.5%. “Many retailers also understand the consumer’s desire for ripe, great tasting fruit, so we are redoubling our efforts to show them how they can achieve that through a conditioning program,” said Kevin Moffitt, President and CEO of Pear Bureau Northwest. In doing this, the organization is excited to be coordinating with the National Mango Board ripening program so that retailers receive a broader message of the importance of getting ripe fruit to consumers. Mangoes make for a logical fit because they have a similar opportunity to pears. “The industry buzz right now is around pear flavor and getting the best tasting fruit into consumers’ hands and stomachs. With this in mind, the Pear Bureau will be focusing resources on a refresh of the pear category, capitalizing on industry momentum, a full crop, and renewed retail interest,” added Moffitt. While a good-looking piece of fruit or a big, beautiful display may catch the eye of consumers and generate a purchase, a great tasting piece of fruit will bring them back for more.